One trip to Edisto Beach is all it takes to become hooked. Families, friends, couples, and everyone else come down to this time-forgotten coastal town for a couple of weeks every year and it make it their home away from home. Many of these people have been to Edisto more times than they can count. They make the long drive down Highway 174 as it winds its way through the dense forest and marshland knowing that when it curls into Palmetto Boulevard their vacation has begun. While the ocean is what draws so many of Edistos visitors to her beach, its also the reason the vast majority of the rental homes are raised up on pilings, which makes vacationing a bit difficult for anyone wheelchair-bound or with any other limitations that make getting up and down flights of stairs a hardship. Fortunately, more and more houses on Edisto feature elevators. 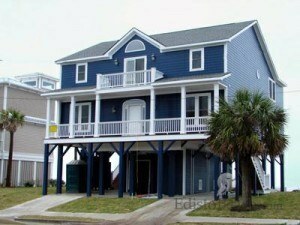 EdistoBeach.com offers several homes with elevators, many of which are on the beach. Beach Music, 3126 Palmetto Boulevard, is a beach-front home looking out over St. Helena Sound. This area of the beach offers gentle waves, a smooth sandy beach, and views of Otter and Pine Island. The home features six bedrooms, six full bathrooms, sleeps 10, offers a gourmet kitchen, a sun deck overlooking the ocean, and many more features to enhance any vacation. This home also features a reverse osmosis system so that the water from the tap is drinkable and visits to the city water spigot are unnecessary. Tropical Breeze, 704 Palmetto Boulevard, is another handicapped accessible home on the beach. The main floor of this home offers elevator access and a first-floor master suite with a hot tub and sundeck. Its location is just seven blocks from Edistos grocery store and main shopping area. Several restaurants are also nearby. This home sleeps 16 and has six bedrooms, three and a half baths, and many amenities. Neuberger, 3408 Palmetto Boulevard, is one of Edistos older beach front homes with a rare ground-level living space with two bedrooms and a separate entrance. An elevator takes guests up to the main floor, which features three more bedrooms. Overall, Neuberger sleeps 10 and is perfect for large groups who want a beach front vacation on St. Helena Sound. For anyone looking to stay in a condo overlooking Big Bay Creek and the Atlantic Ocean, Bay Creek Villa 111 comes complete with elevator access, a private swimming pool, and a whirlpool in the master bath. Time and Tide, Sweet Grass, Four Seasons, and The Pearl are some more homes on the beach with elevators. All of these homes combine the convenience of ease-of-access with the good times that only an Edisto vacation can bring. Keep in mind the almost every store and restaurant on Edisto is handicapped accessible. Beach-friendly wheelchairs can also be rented from the Town of Edisto Beach so nobody has to miss out on any part of their vacation. Interested in the post season rates for handicapped accessible Edisto Island beach houses with elevators.Is there another site that shows interior photos of all these homes? Price rates for each season plus 3-5 day stays?